For anyone who’s a fan of the fun anarchistic version of Venom that was a staple of early 90s Spider-Man comics, then Amazing Spider-Man #317 is the story for you. Insane Spider-Man vs. Venom battle that features a truly creative climax? Check. Crazy, rambling logic from Venom that actually defines the character in an interesting way? Check. Total, unashamed villainy that demonstrates why Venom was such a phenom after he was first introduced? Check. Maybe my opinion of this issue and the overall “The Return of Venom” three-part arc is being clouded by the nostalgia-vision that takes over my brain and eyeballs every time I dust off and read sections of the Todd McFarlane/David Michelinie run. But ASM #317 really is a comic that scratches all my itches as a fan of this medium. Does it have the emotional weight and sophistication of a “If This Be My Destiny?” or “Death of Jean DeWolff?” Of course not. I would never make the claim that this is one of the BEST issues of Spider-Man, but I certainly contend it’s one of my favorites and was strangely absent from my top 10 list that I released earlier this year. I’ve made this point in the past, but it’s worth repeating that I will always hold Venom near and dear to me as a fan because there was such a “special,” “anything can happen” vibe to all of his early appearances and stories. 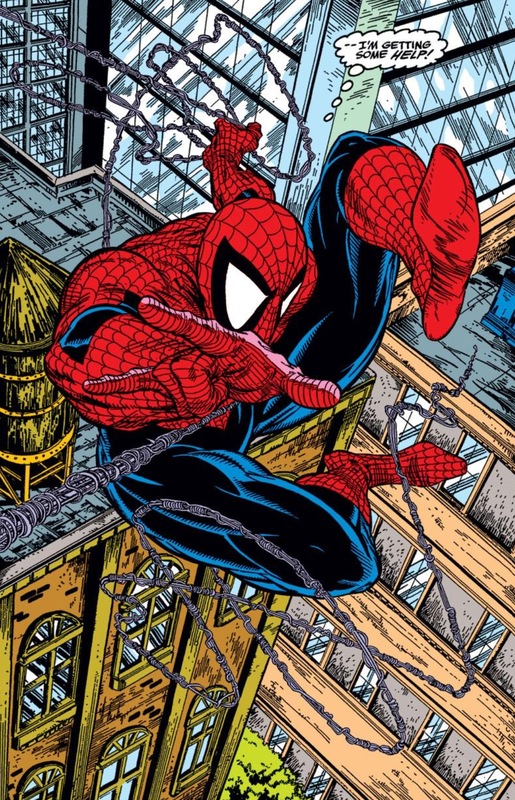 Perhaps that had a lot to do with the fact that he was first introduced in ASM #300, the first bonafide “event” Spider-Man comic I read as a child. 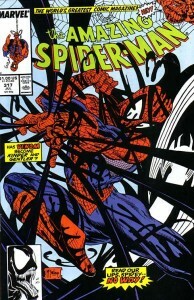 But beyond #300, there are issues like ASM #317. The issue starts with Venom, as Eddie Brock, showing up at Aunt May’s house asking if Peter could “come out to play.” That was such a mind-blowing moment for me to read about when I was younger. Venom already possessed immense strength and a seething hatred for all things Spider-Man/Peter Parker, but to even hint that he could go after Aunt May? That was just unheard of at this point in time (unless you were an Osborn). Then, to have Brock brush aside Peter’s rage by saying he would never attack Aunt May because she was an innocent? Well … if you were a reader seeing this scene for the first time, would you be 100 percent sure that Peter could really trust Brock? I know I couldn’t. So there, in one quick snapshot, is an example of why the early Venom appearances were so titillating for fans. If even Aunt May isn’t off-limits, who or what is? On first blush, this scene almost reads like a stupid Bond villain who just needs to pull the trigger instead of talking about his plan to do something more elaborate. But unlike a Bond villain, who’s just giving 007 a chance to escape while he yaps, Venom truly has Peter over a barrel here. He still holds all the cards and is able to set all the ground rules and because Spider-Man’s “spidey sense” isn’t triggered by the symbiote, Venom is even able to keep tabs on him and shows up at May’s house AGAIN when he sees the Web Slinger fraternizing with the Fantastic Four. Besides, in a backwards way, I actually have a lot of respect for Venom for not wanting to out Spider-Man to the public. There’s something to be said about a crazed psychopath who wants to take a hero down on his own terms, without any distractions or assistance from the likes of the cadre of villains who would jump at a chance to hit Spider-Man as close to home as possible. The fight on the beach – which takes place in Montauk, a place where my family and I vacationed every summer all through my childhood and teenage years – is one of the most creatively staged Spider-Man/Venom fights I can think of. Similar to the battle in ASM #300, Spidey is completely overmatched and has no hope of keeping pace with Venom, but there are some new wrinkles. 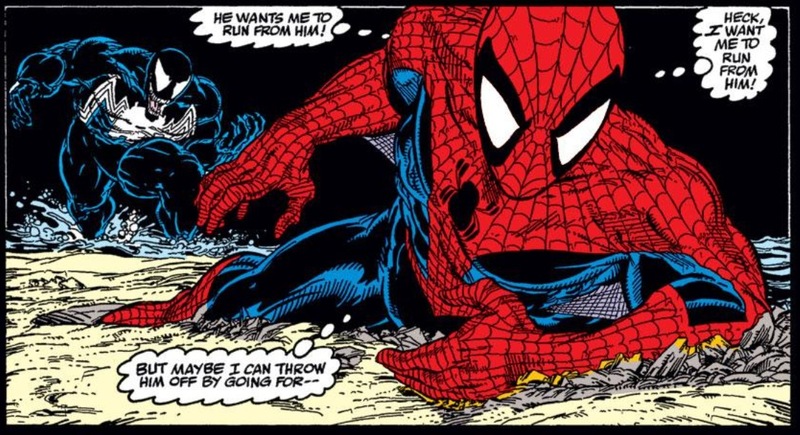 In one panel, Venom sends the symbiote into the sand to reach out and grab Spider-Man and pull him under the ground, so Venom can then pull him close and wallop him. Did McFarlane/Michelinie stretch the power set of the symbiote a bit with this scene? Perhaps, but who cares when a sequence is that visually cool. And then, of course, the final scene of the story, which shows Peter resorting to brain power over physical force to save the day (again). After every trick in the book fails against Venom, Peter throws a Hail Mary when he takes off his costume and tells the symbiote to come and get him. 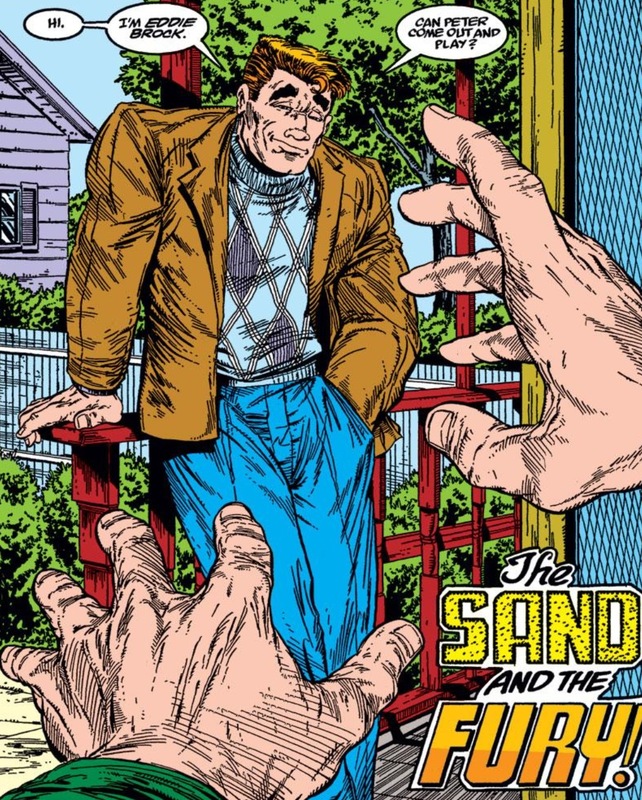 Because the symbiote is still in “love” with Peter, it starts to disconnect from Brock to make its way across the sand and rejoin its original host. 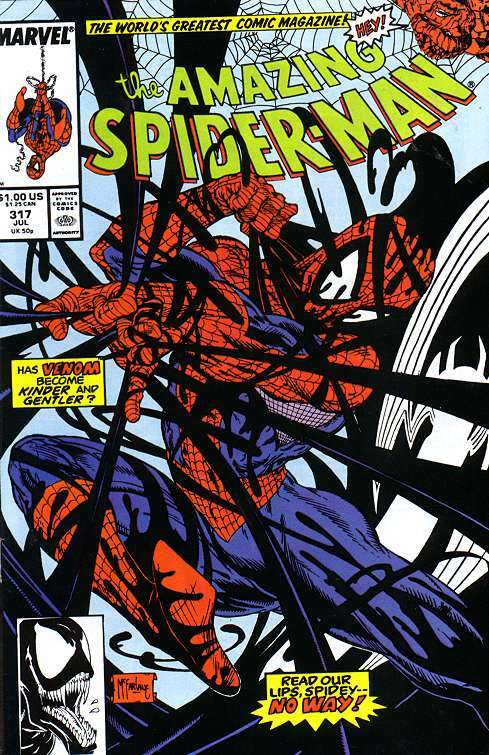 The physical trauma caused by the detachment ends up knocking out both the symbiote and Brock. Beyond Peter using his intelligence to save the day – which is always a cheap and easy way to get me to cheer during a Spider-Man comic – I loved the bigger message that came forth from this confrontation: that as a super-powered human who had the proportionate strength and speed of a Spider-Man, Peter is the more desirable “host” for the symbiote. Brock, despite his anguish and hatred for Parker, is just a patsy – someone being used by the symbiote to pursue a personal agenda. ASM #317 starts with Brock going after Peter in the most personal way possible, and it ends with Peter standing victorious by essentially doing the same thing in return to Eddie. I hear from a lot of people on Twitter about how shallow and empty this period of Spider-Man comics reads in retrospect, but to me, that little twist is a great bit of storytelling. Again, I’m not expressing any shock or outrage over the fact that this run was never considered for an Eisner Award, but I don’t think you can deny that it’s a well-told arc that provides readers with equal amounts of quality action and characterization. As a child this was one of my favorite issues. I must have read it at least a hundred times. The scene at May’s house is truly terrifying and I can’t think of a better issue that highlights just what a personal threat to Peter’s life that Venom is. I first read this comic when I was 10 in the “Best of Spider-Man” TPB. I was freaking out when I Venom arrived at Aunt May’s front door. This story is probably the best overall Venom tale ever, although many others have some shining moments. Part of it is due to this being an awesome story in general, but unfortunately, I think the other part is due to the quality of Micheline’s work with the character taking a huge dive after this. With the exception of the Carnage origin, Venom’s latter appearances under Micheline follow the same three-act structure: escape, first battle, threaten loved ones, Venom stages second battle somewhere isolated because he can’t learn from his mistakes. This was out during my sophomore year in high school and during spring break on a Friday in April 1989, my friend (God rest his soul) bought this issue for me and HULK #357 for my brother. Good times!